Do you know this man? He may be the best coordinator in the NFL. 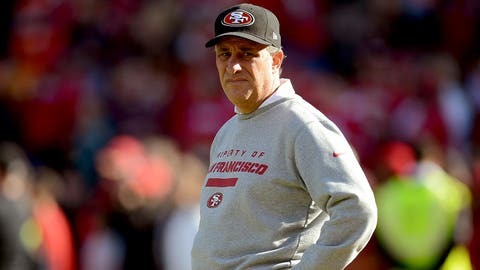 Ron Rivera, Chip Kelly, or Bruce Arians may win the NFL’s Coach of the Year award this year, but San Francisco 49ers defensive coordinator Vic Fangio is my pick for Coordinator of the Year. Don’t recognize Fangio’s name? That’s fine. The 55-year-old defensive coach who got his first NFL gig in 1986 is cool with that. I’m sure 49ers fans would rather it be that way too. They don’t want him going anywhere. Though the rival Seahawks D has gotten a lot more media attention this season, San Francisco’s defense is clicking at exactly the right time, despite a rash of personnel changes and injuries that’d all but cripple other teams. The unit is ranked third in the league in yards per game, third in points against per game, and sixth in takeaways. If anything, San Francisco’s defense is peaking at precisely the right time. Whereas other defensive units — Kansas City and New Orleans, specifically — have seen their numbers dip in recent weeks, the 49ers seem to only be getting better. After giving up 28, 29, and 27 points in its first three games, San Francisco hasn’t given up more than 20 points in any of the 11 games since. No coincidence, the 49ers are 9-2 in that stretch. Video: FOX Football Daily: Super Bowl on a Monday?! Vic Fangio isn’t a man of many words and he certainly isn’t a "look at me" coordinator whose name seems to show up in the headlines. But if we’re handing out some assistant coach hardware, he’d be the first guy I’d look to this year. What he’s done with the 49ers defense is nothing short of super. The Peter Schrager Podcast: Break out the crabcakes and the Old Bay, because this week’s podcast had a real Charm City feel to it. The first guest is Ravens kicker Justin Tucker. Just a few days removed from booting through the 61-yard game-winning field goal on "Monday Night Football" in Detroit, Tucker tells us why he’s such a fan of opera music, discusses the need for a better nickname than the already taken "Legatron" and shares a bit of insight on how former Texas Longhorns players view Mack Brown. Now, on to the picks. Considering all of the favorites and playoff hopefuls that lost head-scatching games last week, we didn’t do all that badly. Let’s finish the year strong. Together. Miami (8-6) at Buffalo (5-9): The Dolphins have gone 5-2 since Jonathan Martin left the team in a season that was supposed to be lost. It shows how much we in the media know. Joe Philbin’s done a marvelous job and the Ryan Tannehill — a guy who’s often forgotten in that 2012 QB class discussion – has done a complete 180 since his low moments a season ago. Miami’s been through too much and has played too mentally tough to drop one to an inferior team at this point in the season. Minnesota (4-9-1) at Cincinnati (9-5): We’ve got a running back controversy in Minnesota! Who needs Adrian Peterson when you’ve got Matt Asiata? All kidding aside, the Vikings offense has played very well since Matt Cassel was handed the reins. Though the front office seemed to want to see either Christian Ponder or Josh Freeman be the guy over the first half of the season, it’s becoming increasingly clear that Cassel’s the best of the three. He’ll play well again on Sunday, but Cincinnati’s not losing at home. They haven’t all season. Indianapolis (9-5) at Kansas City (11-3): No one’s talking about the Chiefs, but since losing three in a row, they’ve lit up both the Redskins and the Raiders in spectacular fashion. The defense needs to get better, though, if Kansas City is going to do anything in the playoffs. They’ll handle the Colts in what might end up being a wildcard preview. Tampa Bay (4-10) at St. Louis (6-8): The Rams pass rush is among the very best in the league, and when St. Louis plays at home, other quarterbacks struggle mightily. I like what the Bucs are doing and think they can spoil things for the Saints in Week 17, but they can’t beat the Rams on the road. Kellen Clemens! Who knew? Cleveland (4-10) at New York Jets (6-8): Both New York and Cleveland were in the playoff conversation a few weeks back. Both are in the NFL Draft conversation now. The Jets pass defense has been abysmal of late and I just don’t see them stopping Josh Gordon. Rex Ryan’s job might be on the line, but Gang Green won’t get him a win. Dallas (7-7) at Washington (3-11): The Dysfunction Bowl! I know Washington’s lost seven of its past eight games, but I can’t take the Cowboys on the road in December with any sort of conviction. Fool me once, shame on you. Fool me 4,345 times, shame on me. New Orleans (10-4) at Carolina (10-4): There’s a lot of talk this week about Peyton Manning and his struggles on the road in big games. Drew Brees appears to be immune from such conversations. But let’s look at the history. Brees has never won a true road playoff game (the Super Bowl victory came in a neutral site). The Saints went 3-5 on the road a season ago, and are 3-4 on the road this year. Do they have a shot versus Carolina in Charlotte on Sunday? Of course. Do I see it happening? No. Tennessee (5-9) at Jacksonville (4-10): The Titans players and coaches could be playing for their jobs on Sunday. I still like the Jaguars, who don’t seem to quit, no matter what the situation. Denver (11-3) at Houston (2-12): A Texans win would be a nice end to a horrendous season. I’ve gone back and forth on this one all week. And the more I look at it, the more I’m digging Houston. The Texans gave the Patriots a heck of a fight a few weeks ago and seem to give the home crowd a game no matter who’s the opponent this year. It’s the holidays. I’m feeling silly. Matt Schaub’s got something big to prove. Houston’s winning this one. Roll with me! New York Giants (5-9) at Detroit (7-7): The Lions can’t seem to get out of their own way this season. The Giants can fix what ails them. The year couldn’t end fast enough for Big Blue. Arizona (9-5) at Seattle (12-2): The Cardinals have quietly won six of seven and could very well be the best team in the league currently not in the playoff picture. I love the job Bruce Arians has done and I love this Bird Gang defense, but Seattle’s not losing at home this year. Not in the regular season, and not in the playoffs. Pittsburgh (6-8) at Green Bay (7-6-1): Someday, we’ll look back and scratch our heads about the 2013 Pittsburgh Steelers. Think about some of their brutal losses this year. Losses to the Titans, Patriots, Vikings, Ravens and Dolphins all could have been wins. If they were, the Steelers would be 10-4 right now. Well, they weren’t. Oh well. I still like Pittsburgh in this one. Even at Lambeau Field. Oakland (4-10) at San Diego (7-7): The Chargers keep on winning and Philip Rivers keeps getting better. Of the three big 2004 Draft class quarterbacks — Rivers, Manning, and Roethlisberger — it’s been the man in San Diego who’s had the best ninth season. I’m riding the Phil Rivers train this week. New England (10-4) at Baltimore (8-6): Last year at this time, the Ravens were losers of three straight games and heading into a Week 16 matchup with the defending Super Bowl Giants. They won that game and were on their way. New England’s lost its past two games against the Baltimore Ravens and hasn’t had much success in that building. It’s all going right for the Ravens at the right time of the year. I’m not picking against them. Chicago (8-6) at Philadelphia (8-6): Jay Cutler won more than a game last weekend in Cleveland. He kept the Bears division title hopes alive, and in the process, may have won himself a new contract with Chicago. His work isn’t done. I think Chicago keeps things going with a win in Philadelphia on Sunday. Cutler, a guy no one wants to believe is worthy of our respect, does the job. Atlanta (4-10) at San Francisco (10-4): The last game at Candlestick Park? With playoff implications for the home team? Yep, give me the 49ers. By a lot.